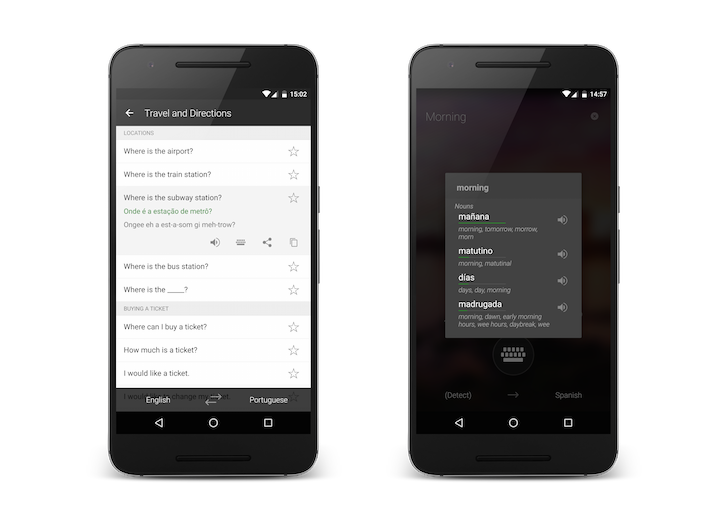 Right on cue for those in Rio for the Olympics, Microsoft has released an update for its translator app, a few months after the previous update got ever closer to Google Translate. The new version, 2.30.112, includes the ability to change the voice used for reading out translation results, alternative translations for single words, and a phrasebook feature for fifty languages. New option in Settings to change the voice that reads out translation results. See alternative translations of single words. Available in 100 language pairs. Tap on the book icon at the bottom of the home screen to quickly access key phrases in 50+ languages. You have the option to favorite, listen to, share, and edit the phrases. The alternative translations option is probably the biggest change here, and one which brings Microsoft's app to feature parity with its rival, Google Translate. In practice, it works well, showing more informal translations for a word, or a different way of saying the same thing in a different context. The phrasebook feature is also excellent, showing lots of key phrases such as "I'd like to change money," or "Do you have a vacancy?" in fifty of the world's most-used languages. Lastly, the app now has the option to change between male and female voices for reading out results. While my go-to language app is Google Translate, Microsoft's offering certainly rivals it; Rita compared the two last year and found the newcomer definitely holds its own. Translator can be found on Google Play, or at APK Mirror if you prefer.